By the way, I don’t believe I was choking on actual food, but my larynx was spasming. That incident is part of a larger story about my health the last few years, but that’s a whole other post, y’all! The second embarrassing instance that week was more of a spiritual choking sensation, but it has haunted me just the same. The clinic was set up and several of us were working in the pharmacy, filling prescriptions and all that, while our two group leaders, Roy and Tony, were checking to see how everyone was doing. They stopped to talk to Jeremy and I heard them ask if he could preach at one of the Haitian congregations tomorrow. I totally thought they were kidding! Like tomorrow? As in, come up with a sermon AFTER a tiring day of working in the clinic? But I soon realized they weren’t – ha! They kindly said, “You don’t have to, but we really need some others to help.” Jeremy paused to consider. And I snapped into Husband Protection Mode. I knew how hot and tired he was. I knew the stress of being a pharmacist on a medical mission trip (we’d traveled to Nicaragua a bunch already). I knew how hard he would try to work to come up with a good sermon and how he never waits until the last minute to work on a Bible lesson. But Jeremy said, “No, I’ll do it.” And they thanked him and left…and I started to feel shame at what I’d done. 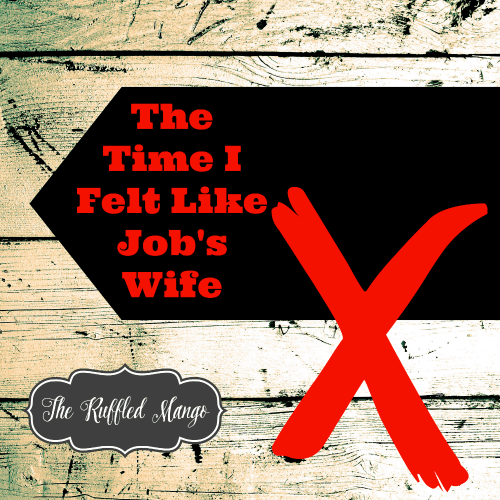 I had only been trying to protect him from extra stress and extra work, but I had literally discouraged my husband from preaching the gospel. I look back and think of that moment with sadness. We were on a trip with a mission to spread the gospel, but I faltered. Alarm bells were going off in my head and I just…choked. And I think that was my Job’s Wife Moment. Sure, I didn’t say, “Curse God and die.” But I got my dander up and tried to get my husband out of an awkward situation. He thankfully didn’t take my out, though, because he’s pretty Job-like. I should have been thinking about the Bigger Picture, but I lost sight of it there for a minute. And I’m not proud of that. When we got back to the guest house that afternoon, Jeremy ended up having enough time to plan out his sermon – and he did a fantastic job the next morning. I was so proud of him for saying “Yes,” even though I had encouraged him to say “No, thanks.” It’s true – God uses those who say YES, even when they might not feel up to it. He will help us feel up to it. He will lend us His strength. How did I forget that?? I’ve had a hard time forgetting such a faithless action, but I know that God has forgiven me for my misstep. I might’ve momentarily choked, but the Holy Spirit breathed new life back into me, and I became fully on board with our mission.